Celtic Park played host to an unusual England versus Scotland football match on the second of March 1918. 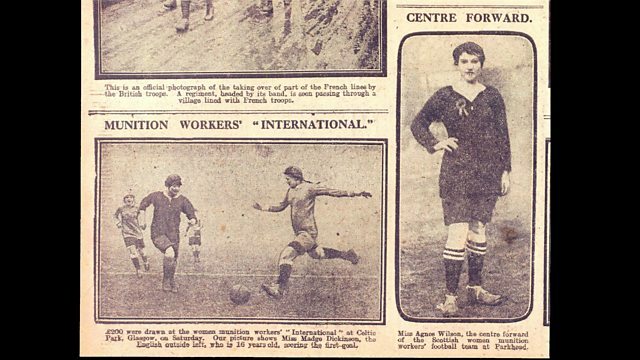 Both teams were made up of women from munitions factories. The Scottish women were all drawn from William Beardmore’s iron and steel works in Glasgow, while the English team came from the Vickers-Maxim factory in Barrow-in-Furness. Celtic Football Club lent their support – and their stadium – because one of William Beardmore’s factories, the Forge at Parkhead, was close by. The match was played to raise funds for the war effort and the day of the clash had something of a carnival atmosphere: artillery displays, donkeys and an aerial fly-past were all organised to entice the crowds. Despite a strong initial showing from the Scottish team, within ten minutes they had conceded an own goal. The English team took the initiative, and by half time the English ladies were up three – nil. The final score line was England 4, Scotland 0.